Bry and I headed up to The Lot last night and the place was pretty ravaged from Saturday nights torrential rains. The new line was still soaked and the flat between the 1st lander and 2nd lip of the big set had a 1 foot deep trench that eroded away....despite the fact that Bry had buried a 4" drainage pipe. Mother Nature laid down some watery whoop a$$ on us! After some patching up, filling, and packing Bry had the big set rideable and I sat and snapped some photos. 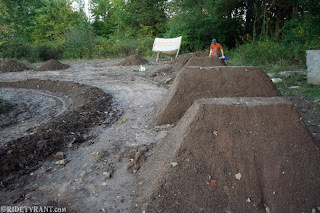 Rumor is Dave Blachura's B-Day Jump Jam is Sunday, October 25th...some come ride!